Davis, known nationally for her leadership in the Civil Rights movement in the 1960s and 1970s and her more recent work on abolishing the prison industrial complex, was selected to give the keynote speech at UCSC’s 31st annual convocation, in part due to her ties to campus. No, that is not what she is known for. Davis is mainly known for her murder trial. She was associated with the Black Panthers and she bought the guns that her boyfriend used to kill a judge, and was a fugitive for a few months. President Nixon called her a "dangerous terrorist". It was the OJ trial of the day, and she was somehow acquitted in a politicized trial. The second thing she is known for is being a VP candidate on the American Communist Party ticket. She is a black lesbian feminist. Her doctoral degree is a bogus degree from East Berlin. So, “political activist” Angela Davis, longtime member of the Communist Party USA and its Vice Presidential candidate in 1980 and 1984, supplier of the weapons used to murder Judge Harold Haley in August of 1970, 1979 recipient of the Lenin Peace Prize awarded to her in Moscow by the Soviet Union (during the height of the Cold War) and long-time feeder at the UCSC trough has been given $15,000 of our tax money to preach her anti-Semitic rhetoric in the name of Martin Luther King, Jr. Chancellor Blumenthal defends UCSC’s subsidy of Davis’ hate speech as an “opportunity for constructive debate on the merits of different viewpoints.” This is the same chancellor who could not figure out how to come up with $250,000 to help subsidize the far more academically worthy Shakespeare Santa Cruz. It is time the taxpayers of California got what they are paying for — an affordable university system capable of preparing our young people for productive careers. Teaching them to hate their country, hate Jews and commit acts of terror should not be on the syllabus. After attending Angela Davis’ lecture in honor of MLK Jr. I was disappointed with her speech. She said that American police from various cities have gone to Israel to learn how to fight terrorism and therefore Israel was to blame for police action in America against citizens of color. This example portrays Prof. Davis’ rabid bias against Israel. In her discussion of the recent fighting in Gaza, Prof.
Davies failed to mention how Hamas terrorizes its own civilians while firing hundreds of rockets at Israel. While she espoused the rights of women, there was no shred of criticism of Palestinian society which is repressive to women and gays and has no freedom of the press. Why does she support Palestine where there is no minimum age for girls to marry, a woman’s testimony is worth half that of a man, and “honor killings” of women is practiced. Singling Israel for criticism is Anti Semitic and contrary to MLK Jr’s support for Israel. Apparently DeCinzo didn’t get the memo on ethnic studies, that any attempt to initiate a dialog on the failure of liberal education policies is always met with accusations of racism and the need for censorship. Rather than the self censoring that has been the result of political correctness and the fear of being called a racists, all subjects should be up for discussion. Ethnic study programs are almost never about cultural heritage, instead it is the liberal demonization of capitalism, white privilege and the self fulfilling prophesy that minorities can never prosper in a rigged free market, hence the need for socialism and forced equality. This is usually followed with the absurd premise that a school curriculum should be based on race. 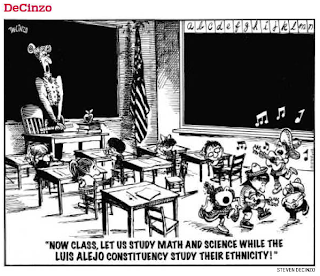 Instead of ethnic studies that divides up the student populations by race, color, religion and/or language, how about an emphasis on assimilation and the need for an informed electorate. Under a new bill, California’s public high schools could be required to offer ethnic studies classes as part of an effort to build cultural understanding. I am actually OK with ethnic studies, as long as I am the one who gets to teach the White kids about their heritage. LOL, somehow I don't think that would be allowed to fly.